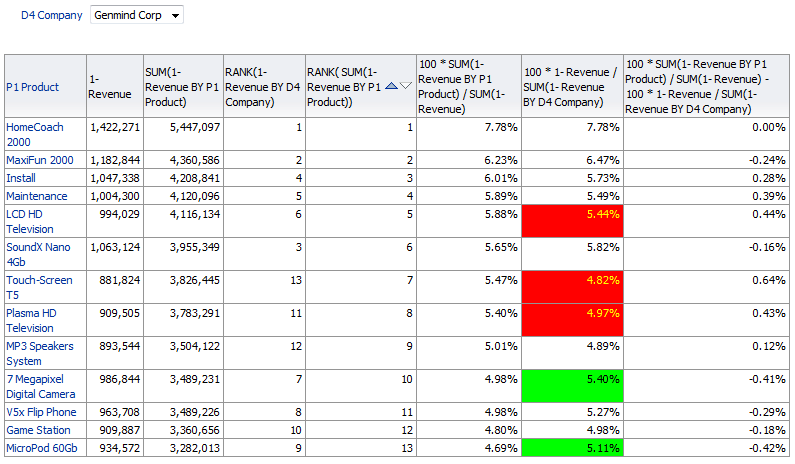 In the post OBIEE - Comparing performance to peers I covered 2 options to create an analysis where we compare the performance of particular group member, with the entire group. We used 2 methods, Option 1: with aggregation on the entire group (and selection step) and Option 2: with filter function on the group member. 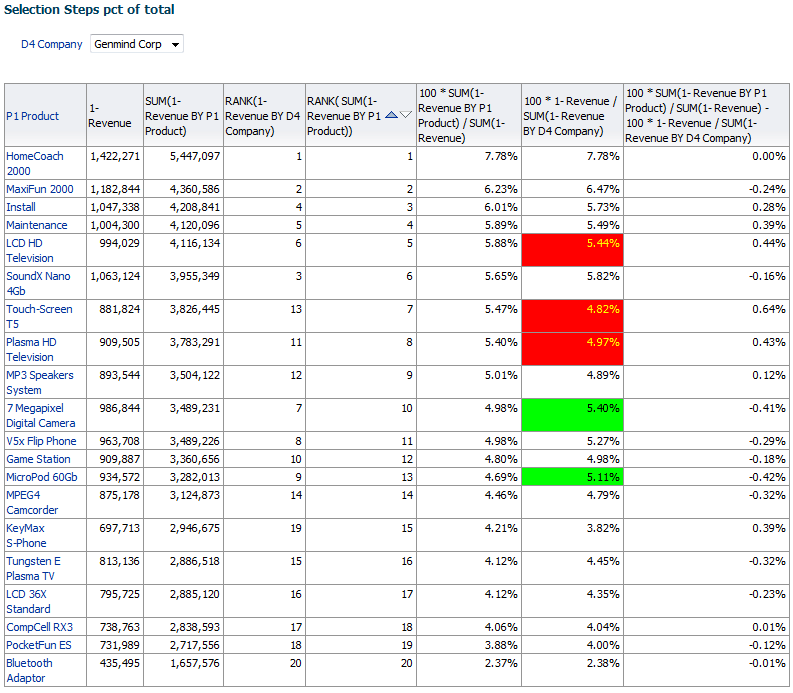 Compare the member to the rest of the group and not entire group (subtract the member data from the rest). Comparing values or % of total and not Ranking. Limiting presentation by minimal % and not specifically top 10. The first option described here is not connected to the other 2. 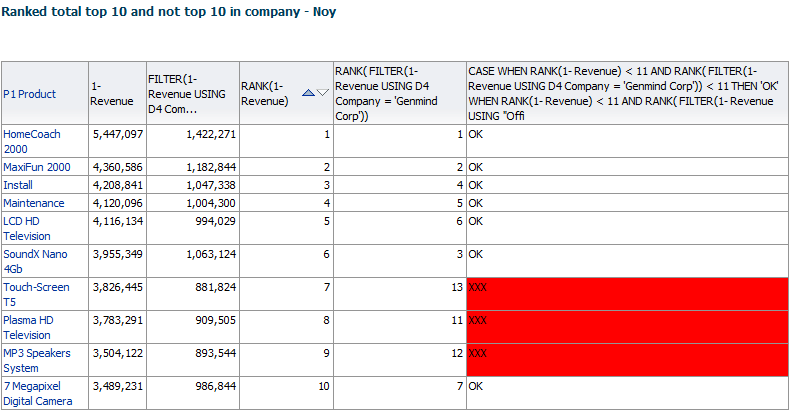 Compare to "All the group" or "the Rest of the group"
In the post we compared the revenue of member (specific Company) with Revenue of the entire group (all members). In small groups the influence of each member might be significant. 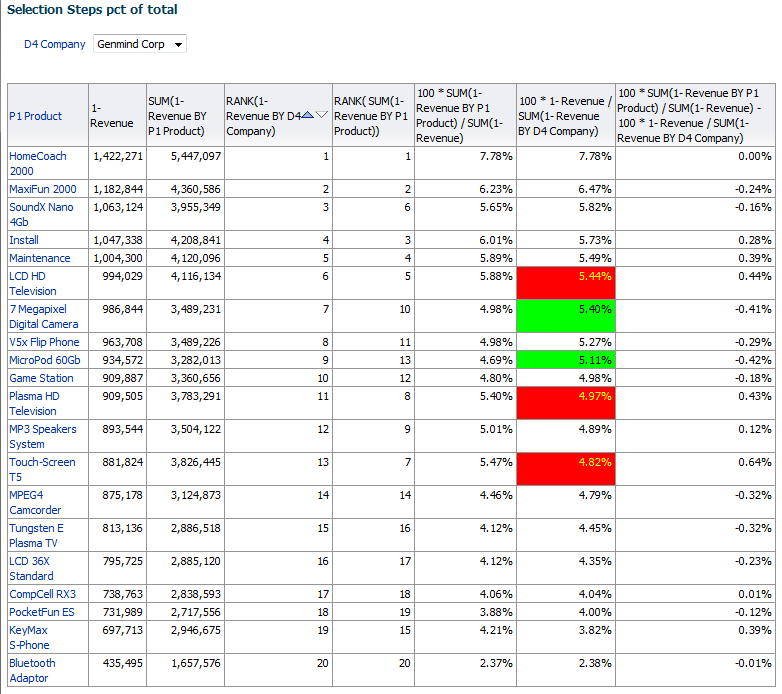 In our example there are only 3 companies. I believe our comparison would be better if we remove the specific company Revenue from the total. We can subtract the member value from the group total to achieve it. This should be done with the second option - the filter function. Why? Because the first option of the previous post would end up with problematic result. Since there is a problem with the Total Ranking order, where are Ranks 2 and 3? 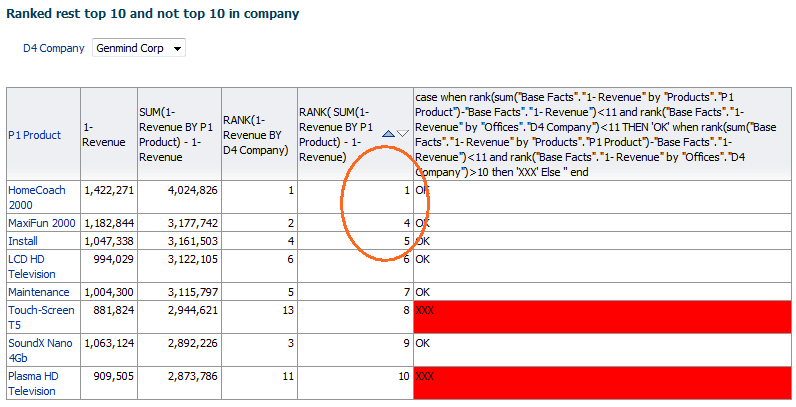 In the previous example the grand total for each company of a specific product was the same so the relevant Ranks were the same. 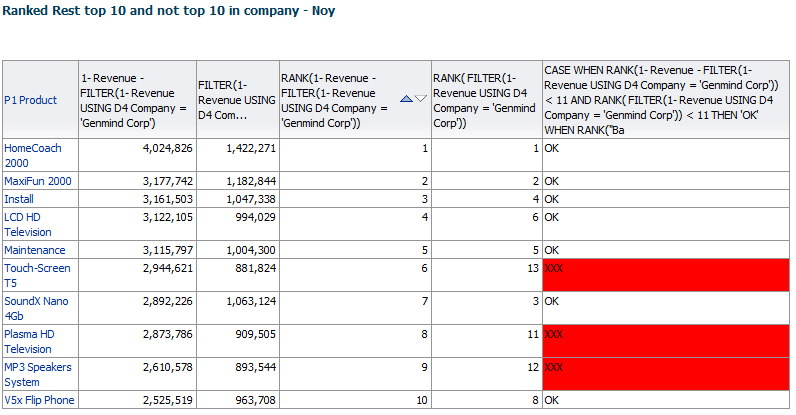 Now since we subtract different Revenues, the Ranks are per combination of product and company! 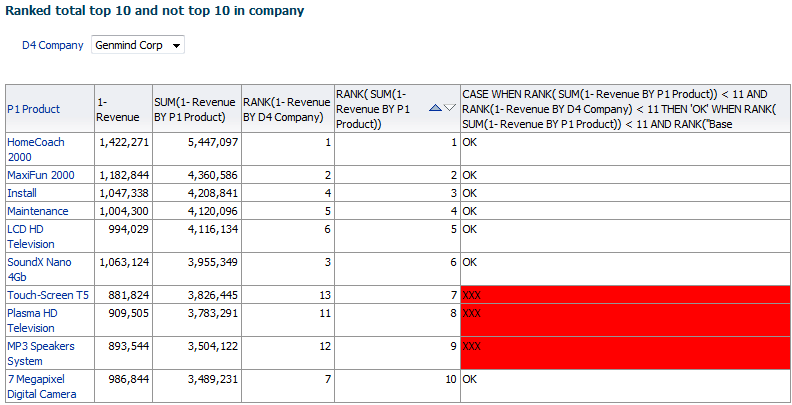 This problem does not happen in the Filter Function version, because we subtract the same value for each product. Remember to change the analysis filter to the updated Rank<11. 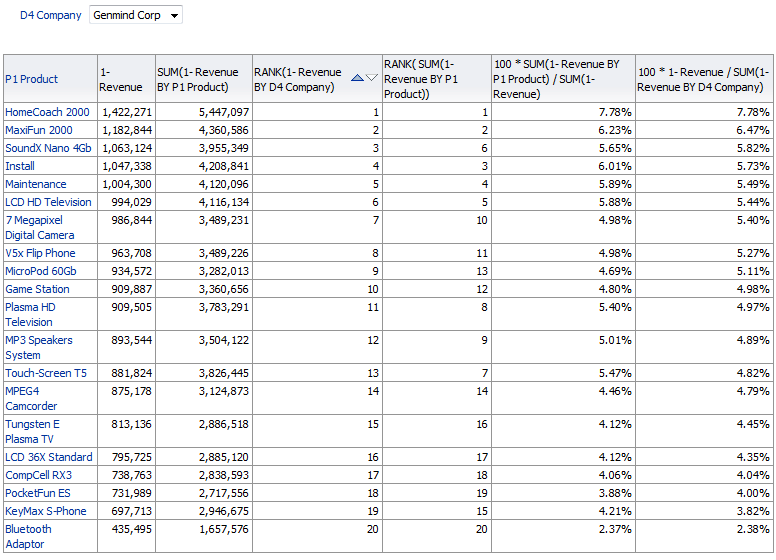 Comparing revenue to the average revenue per product of the others. Comparing to % of Total products. The second option is better in our case since the companies might be of different sizes. To make things readable I will start from the previous post example of comparing to all group members. Now we can decide what is the percentage difference we want to emphasize. 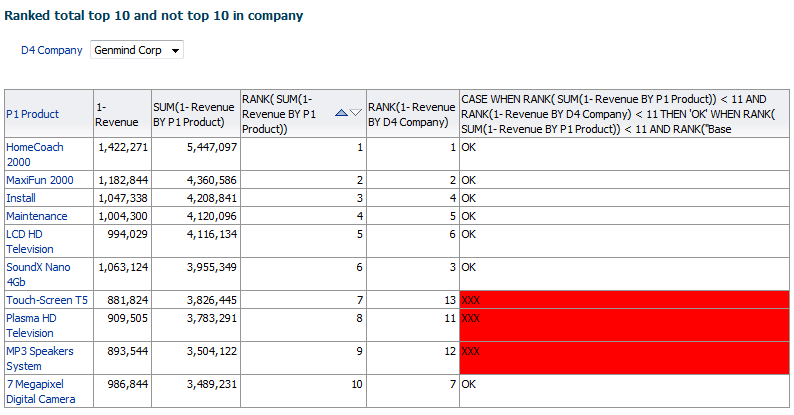 For example I'll create a column that subtracts the 2 new columns and mark the cases there is a difference of over 0.4% (or anything that works for you). Now we can hide/exclude/remove any column we don't need or don't want to show. The selection of top 10 is somewhat random, since not all data is evenly distributed like in our case.I'd rather use a specific % of total. For example 4.5%. Now we can return to the selection steps option again, since we don't depend on Rank any more. The calculations of the previous type work fine with percentage options.